Students run out of Columbine High School, Arpril 20, 1999. After authorities mounted a massive search for Sol Pais, 18, she was reportedly found dead after law enforcement closed in on her near the Echo Lake Lodge at the base of Mount Evans in Clear Creek County. Paid had traveled from Florida to Colorado where she reportedly purchased a pump-action shotgun and ammunition. “She is armed and considered to be extremely dangerous,” the Jefferson County sheriff’s office said prior to the conclusion of the search. 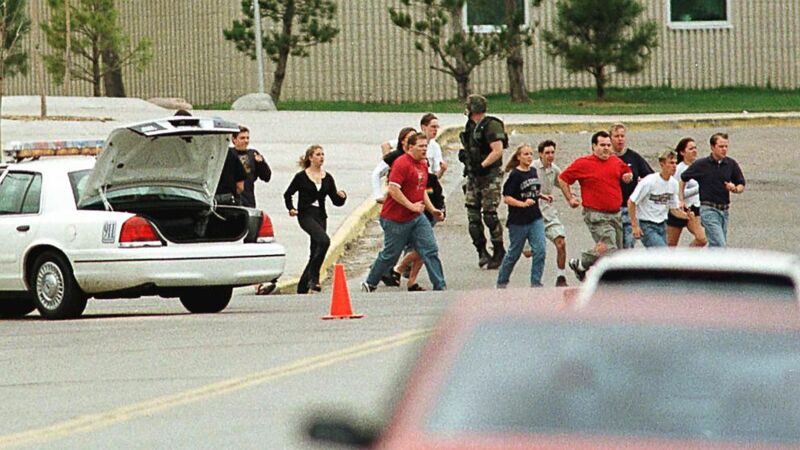 Security fears have soared because Saturday is the 20th anniversary of the massacre, at the time the deadliest school shooting in U.S. history, which unfolded in the Denver suburb of Columbine. Two heavily armed gunmen killed 12 fellow students and a teacher before taking their own lives on April 20, 1999, setting off an era of mass shootings in U.S. schools and other public venues. “Metro area school districts will be closed on Wednesday, April 17 due to ongoing safety concerns,” the Colorado Department of Education announced on its Twitter account. That was a step up from Tuesday when it put Denver area schools on lockdown following an alert from the FBI and stepped up security. Authorities posted pictures of Pais, her unsmiling visage framed by shoulder-length brown hair. She was last seen alive in Colorado on Monday night, the sheriff’s office said. “We are operating out of an abundance of caution. The threat is not isolated to one school or individual,” Colorado’s public safety department said on Twitter amid the hunt.